It is easy to fall in love with the beautiful Tuscany region, where the Italian language was born. It is not only the largest region in Italy but with its idyllic landscape and many UNESCO World Heritage Sites and some of the most precious art work in the world it attracts more than 10 million visitors every year. It is only natural that in one of the most beautiful places in the world one will also find the most beautiful of horses! The upcoming 3rd Summer Sale already casts its shadow, directly following the Menton International Show: Join Giacomo Capacci Arabians on July 4th for an exciting Summer Sale, which has some spectacular lots in store. 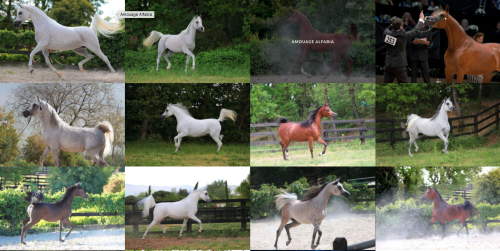 Giacomo Capacci Arabians is located in Cortona in the province Arezzo, in Tuscany, Italy. There is a legend that tells of the foundation of Cortona and states that 108 years after the Great Flood, Noah himself entered the Valdichiana via the Tiber and Paglia rivers. Noah preferred this place better than anywhere else in Italy, because of its fertility. “Quality will never be out of fashion and quality is the way to be remembered” is a maxim of Giacomo Capacci. Therefore he ensured that the offers of the 3rd Summer Sale are of top quality mares, fillies of Straight Egyptian Arabian and purebred bloodlines, horses everybody would be proud to see in its own stable. Among the exquisite list of horses is the refined bay Besson Carol daughter Arwa Aljassimya out of Athina El Jamaal by Maysoun - a son of Ansata Halim Shah - and out of Athenais El Jamaal by Ali Jamaal. Arwa Aljassimya not only achieved 2017 Scottsdale Silver Champion Senior Mare and 2017 Las Vegas ABWC Silver Champion Senior Mare, she is also a half sister to World Champion Ghazwan Aljassimya. Other bay beauties are KZ Fairouz, a 2016 born filly by World Champion Fadi Al Shaqab out of KZ Nour Al Lail. Or the 2008 born Mystica Maghi, a daughter influential mega star Marwan Al Shaqab out of ZT Maghan, making her a full sister to International Champion Mare Sarah Al Mohamadia. Discover the beauty of the fleabitten Ajma DL, a ten years old daughter of Ajman Moniscione out of Giamila, who is checked in foal to Wadee Al Shaqab. A special bonus in the catalogue is the embryo right for a full sibling to Multi World Champion EKS Alihandro, by Marwan Al Shaqab out of OFW Psylhouette. Only the sky is the limit for such a foal! EKS Alihandro is not only a superior show horse but is emerging as a significant sire, with his daughter Om El Erodite recently setting a record price of US$ 1.550.000 for an Arabian yearling sold at auction.